Thermoprobes with buried condensers are designed to release the heat picked up from the subgrade through the near surface soils or embankment. 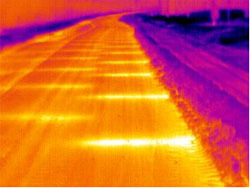 A typical application for these units is in roadway or airfield sections where heat is released just under the pavement. The condensers can be coupled to either vertical or sloping evaporators. The system is designed to provide a net cooling below the embankment section to preserve the permafrost. Because the condensers release heat through the surface, insulation can be used in the design without the icing effects that are typical of insulated sections. In cold climates, this system is generally not designed to thaw ice and snow on the pavement, however, it will cause sublimation that will loosen the bond between the pavement and the ice. The closer the condensers are to the surface, the better this system will work. The standard finned condenser will out-perform a buried condenser in most cases, however, the standard condensers are prone to damage and can be inundated in snow if not properly designed for the application. Arctic Foundations of Canada manufactures permafrost foundation systems incorporating thermosyphons under the trade names Thermo Piles and Thermo Probes.